Those who enjoy fine dining and top restaurants will not be disappointed when visiting Marbella, which boasts a large selection of eateries. 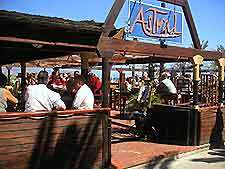 Many of the restaurants in Marbella are targeted at the tourist market, serving a diverse range of cuisine from around the world. Restaurants in Marbella are known for their seafood, with many of the main meals being based around the area's freshly caught fish. Traditional Spanish dining establishments are plentiful here and often serve local specialities, which include fried fish dishes, grilled prawns, fish stews, lobster, tortillas (omelettes), paella, cold meats and tasty sausages. The epitome of Spain, Tapas bars can be found throughout the Marbella area, often in central locations, especially around the Plaza de Altamarino, the Plaza de la Victoria and along the Calle San Lazaro - a narrow street close to the Plaza de los Naranjos, where a cluster of Tapas bars can be found. Designed to accompany wine and drinks, Tapas is small savoury Mediterranean-style snacks, such as cheeses, seafood nibbles, stuffed olives, pickled anchovies and sardines, to name but a few. Particularly popular at lunchtime, Tapas bars and restaurants are the perfect way to sample the local cuisine and enjoy the Spanish way of life. For those who have a more limited palate, a number of steakhouses and more English-style dining venues can be found in Marbella, serving large steaks, burgers, fish and chips, salads and international dishes. Marbella is also know for its outstanding Chinese restaurants, which are amongst the best in Spain and also serve a variety of vegetarian dishes. 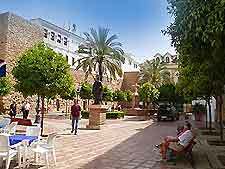 Further eateries are concentrated around the Plaza de los Naranjos, with the whole square being transformed into an outdoor dining terrace as night time approaches, although restaurants in this part of Marbella can be a little overpriced. 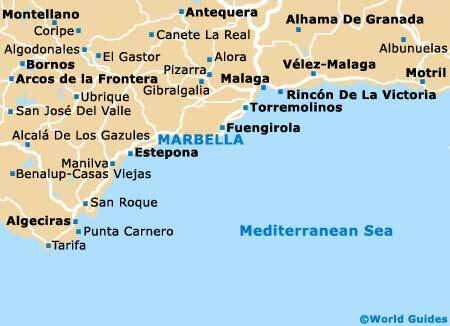 Marbella is home to a number of fast-food outlets and pizzerias, where inexpensive snack food is readily available for those in a hurry. Some of the best can be found around the Puerto Banús district, where many celebrities moor their luxurious yachts. Nearby, San Pedro de Alcántara is one of the most stunning parts of the Costa del Sol, with a selection of restaurants and bars close to the beaches. 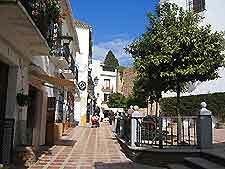 The main thoroughfare in Marbella, the Avenida Ricardo Soriano is a particularly lively part of town and is lined with shops, together with a number of top restaurants and coffee shops, often featuring outdoor dining areas. Those looking for more of a village character should head to the Estepona area, close to central Marbella, where a cluster of popular restaurants can be found on the terraces, overlooking the marinas.